Following the route of the Union Pacific Railroad across the Great Plains of Nebraska and far westward into Wyoming, one will find that many of the towns along the way are situated one hundred miles apart – give or take a few miles. The reason for this is that at the time the great cross country railroad was built, one hundred miles was considered to be a more or less standard daily “run” for a train crew. During construction of the railroad, depots, switching yards, and maintenance facilities were built at these one hundred mile intervals. As a natural consequence, train crew families, maintenance workers, storekeepers, and other citizens from all walks of life established towns around these railroad centers. 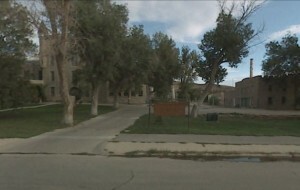 One such place is the town of Rawlins Wyoming, lying in the southern part of the state right along the Union Pacific Railroad about half way between Laramie and Rock Springs. During the mid to late seventies, an energy boom was in full swing in this country and Rawlins was close to the heart of where all the action was. It was to this town that my gunner, one Ignacio Antonio Romo and I were sent in the summer of 1977 to carry out a variety of design and control surveys in support of the rehabilitation and expansion of the town’s utility infrastructure in order to accommodate the town’s rapidly growing population. The sign shown in the picture proclaims this place was home for a time to three members of Butch Cassidy's "Wild Bunch." It also announces that it housed William Carlisle, who is best known as the last of the "great train robbers" of the wild west. One such design survey called for locating the physical features and ground elevations along the route of a proposed water line that happened to run close alongside the east wall of the “yard” of the prison shown in the picture to the right. Though we did not have to survey inside the actual prison walls we did have to carry out some of our work inside the surrounding chain link and razor wire fence while in the company of an armed guard. He was watchful and protective of us as we carried the design survey on through the grounds, eventually tying it into a large survey control network of monuments we had established that surrounded the entire town. Whether what I am about to relate to you happened on the same day that we surveyed through the prison grounds or on a different day is beyond my memory, but it happened that we had to carry out some survey measurements by occupying one of the survey control monuments earlier described. The monument was located on the top of a small rock strewn knob that we were able to drive up onto, and it was there that I experienced my closest call up until that time with a poisonous snake. My memory of the event is that “Tony” had driven us to the top of the knob by the use of a trail that ran across a saddle between a small mesa and the knob; the knob itself being almost completely surrounded by very steep terrain, with the exception of the approach road from the saddle. As Tony drove onto the top of the knob he circled a bit, possibly dislodging a stone under which a rattler may have been lying in refuge from the mid-day sun. This maneuver, if it did happen this way, must have put the snake into a state of confusion about which way to go in an effort to escape. When Tony came to a stop I exited the vehicle and had only taken a step or two when I caught a movement out of the corner of my eye that caused me to instantly spring sideways. Now I don’t usually go around jumping practically out of my skin at every little movement but this case was different. We were well aware that we were in snake country. We had been warned by local citizens about the danger of snakes in the outlying areas of town and had been talking about all of those things so I was wary and on edge as I stepped away from the truck. I suppose it was just my misfortune to step close to an already angry prairie rattler about twelve or sixteen inches long. The time was right in the middle of August – the so called “dog days” of summer. Rattlers are ill tempered characters even on a pleasant spring morning but when you run across one of those things on a one hundred degree August day at high noon – and then go out of your way to try to make it mad by driving a truck practically on top of it you’ve got a whole new invention on your hands. 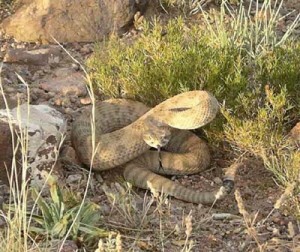 Rattlesnakes don’t have to coil all the way up to strike, they can sort of draw up a little and thrust forward to their target quite effectively. I suppose the movement I first saw was its drawback to strike rather than its forward thrust – whatever the case, the snake was way too late. By the time it had reached the limit of its striking range I was already a good fifteen feet sideways and about the same amount downhill. If there is a world record for leaping sideways I must be the holder of it. I suppose I was lucky on two counts. If the snake had hit me I would have been a little worse for wear but would probably have survived, but if the case had been that Tony had positioned the truck such that my movement would have put me over the steepest side of the knob instead of onto the downslope of the approach road, my record setting side leaping manuever could have resulted in an incurable condition. The knob didn’t have vertical cliffs such as a “butte” usually has but the terrain was steep enough that I wouldn’t have stopped tumbling in any amount of time less than about five minutes. It wasn’t exactly like I took time to take the lay of the land before leaping. 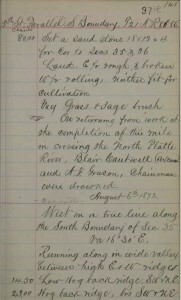 Field notes of the running out of 640 acre sections of land near Rawlins Wyoming in 1872. 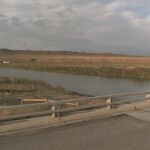 View of the North Platte River looking southwest from the eastbound lane of I-80. The field notes shown to the left explain how two surveyors were far less fortunate than me while carrying out their duties in the vicinity of Rawlins Wyoming over one hundred years prior to my small misadventure. I have on many occasions used old notes like the ones shown to locate and use stone markers exactly like the ones referred to in these notes. In fact, I have used stones all around Rawlins that this crew could very well have set. As best I can make out from the scant description in the notes, the tragedy referred to occurred about fifteen miles east of Rawlins, about where modern day I-80 crosses the North Platte River. The field notes refer to the last corner set being five miles or so west of this location. There is some possibility the river shifted course over the last one hundred years or it may have been that the men were returning along previously surveyed lines to a campsite on the eastern shore of the river.